By Christie C. White, M.Ed. As a long-time special education professional-turned-advocate I simply cannot say enough about the value of this book for parents. I recommend it to anyone who is going through the special education process for the first, or fiftieth, time. With a robust Foreword by the well-regarded Robert K. Crabtree, Esq., this accessible gem gives beginner and veteran parents alike a simple, straightforward overview of federal and state special education laws and their relevance to common situations parents may encounter. 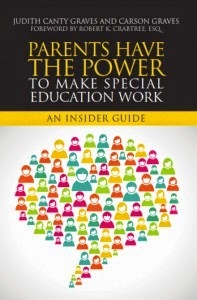 More immediately, this book offers practical strategies for parents navigating the seemingly never-ending maze that has become special education in the United States. Main chapter topics include: understanding the perspective of school personnel and how and why conflicts of interest arise, understanding evaluation reports, writing measurable IEP goals, handling Team meetings, why keeping good written records is essential, the legal process, and planning for transition to adulthood. Chapter 7: Writing Effective IEP Goals in particular had me enthusiastically nodding with each paragraph and marking up the margins. With real examples of IEP goals and benchmarks this chapter alone is worth the cost of the book. Additionally I have not seen a better discussion elsewhere specifically for parents on the relevance of writing specific, measurable goals as it relates to tracking a child’s progress over time. I think parents will also find chapters 8 and 9 especially useful as they speak to the daily realities of meetings and paperwork and how to handle these situations effectively and productively. October 7 (Tuesday) 7:00 - 9:00pm: Stressed-Out Students: How Boarding Schools Can Help. Panel discussion with admissions officers from five schools at the Wellesley College Club. Co-sponsored by NESCA and Hunnewell Education Group. Five schools.FREE and open to the public; advance registration required. Details HERE.